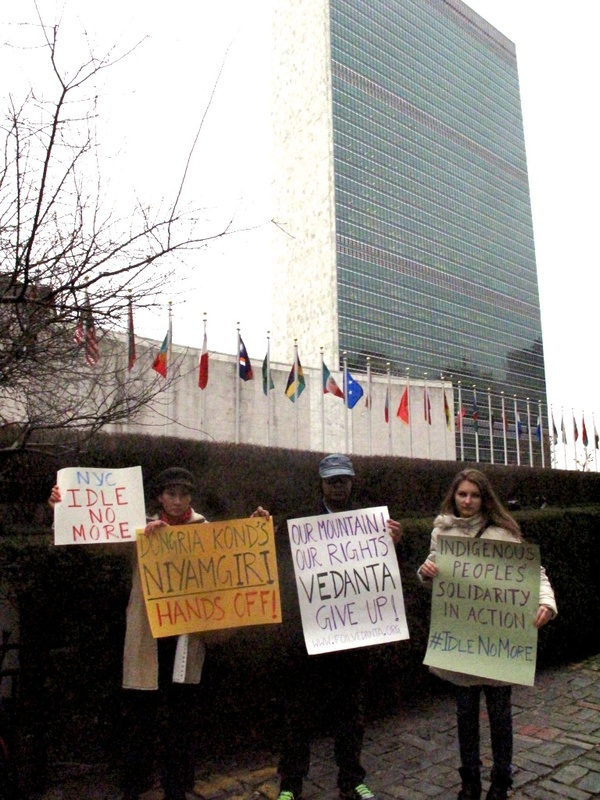 People across the globe have registered their protests against Vedanta once again. On January 11, parallel demonstrations took place in Orissa, London and New York where activists in hundreds raised slogans and upheld placards to denounce the corporate annexations of indigenous peoples’ lands. From Niyamgiri hills, more than 500 people turned up at a rally which covered about two kilometers in the Bhawanipatna town. Resistance movements in Lanjigarh have also inspired tribal representatives of Karlapat region whose mountains are now being targeted by the mining companies. In this rally, several people who were cheated of their lands narrated the atrocities and tortures they faced from Vedanta highhandedness in Lanjigarh. They also gave an account of how the company goons and the local police routinely harass the women in the afflicted areas. 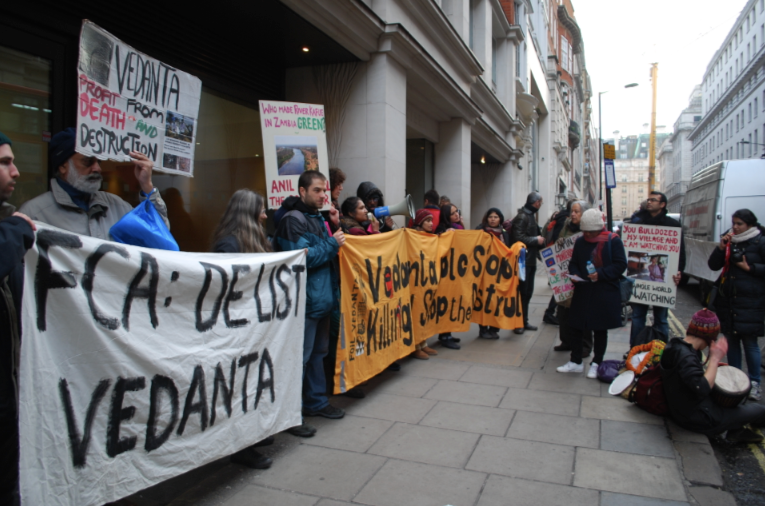 In solidarity with the indigenous peoples of Orissa, a loud group of protesters from Foil Vedanta and other grassroots groups mobbed the company’s Mayfair headquarters in London the same day. Holding a banner that read “FCA: de-list Vedanta”, the demonstrators called for the Financial Conduct Authority to remove Vedanta from the London Stock Exchange for poor corporate governance and human rights crimes. Simultaneously, the Supreme Court of India has deferred its final verdict on Vedanta’s planned mega-mine until 21st January. If permission to mine is denied Vedanta is likely to close its Lanjigarh refinery due to lack of bauxite costing them billions. On Sunday the Minister for Rural Development Jairam Ramesh plans to visit the threatened mountain to visit the Dongria Kond. Various grassroots groups including Phulbari Solidarity Group, Japan Against Nuclear, Tamil Solidarity and London Mining Network, along with Foil Vedanta gathered at Vedanta’s London headquarters to add their voice to recent pressure for Vedanta to be de-listed from the London Stock Exchange for its poor corporate governance, illegal operations and major human rights violations. They shouted ‘Vedanta out of London’ and blew horns and whistles. Several parliamentarians and the former CBI Director Richard LambertLondon have highlighted how Vedanta’s listing is used for legal immunity to hide their corporate crimes. “Vedanta is a London listed company and profits from this affiliation. It is typical of Vedanta to assume they are above the law and above public accountability. We will continue to draw attention to their corporate crimes here in London”. 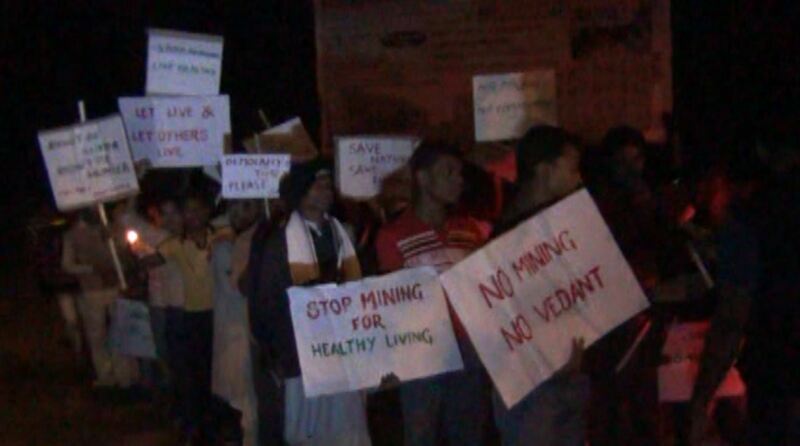 Activists at the rally in Bhawanipatna chanted “Vedanta go back: water, land and forest ours. We are Supreme people of the supreme court” while dalit leader Surendra Nag spoke about the loss of land and livelihood for local people, some of whom have ended up as beggars. One man spoke of how his whole family had been tortured by company goons and they had lost 6 acres of land to the company without compensation. The project has been racked with controversy from the start, as a spate of recent coverage points out: The Lanjigarh refinery built to process the bauxite from the hills was illegally constructed, the court case presided over by a judge with shares in the company, and the refinery should never have been given permission without including the associated mega mine in impact assessments. The Delhi High Court is also currently investigating the large donations from Vedanta to India’s two main political parties which could be deemed illegal as Vedanta is a foreign (British) company. A cover story in “Open Magazine” in December details evidence of corruption and collusion between Vedanta and the Orissa state government, local officials, judges and the police to force the project through. Meanwhile Vedanta’s chairman and 56.7% owner Anil Agarwal has launched a rare PR crusade claiming that Vedanta ‘have not cut one tree’ and respects and preserves the rights of the protesting indigenous tribe living on the threatened mountain. He sets out his extractive philosophy for India – suggesting that exploration should be drastically increased and regulation decreased to provide for the domestic market for metals and oil. If Vedanta loses the case to allow state owned company Orissa Mining Corporation to mine the mountain on their behalf they may have to close the dependent Lanjigarh refinery costing them billions. Under enormous pressure from Vedanta the Orissa government has suggested alternative bauxite supplies from a deposit located in a major wildlife sanctuary and tribal area at Karlapat arousing anger and opposition from grassroots groups. The court’s decision rests on whether the Green Bench of India’s Supreme Court rules rules the rights of forest dwellers to be ‘inalienable or compensatory’. In view of this, India’s Tribal Affairs Minister V Kishore Chandra Deo has asked the Environment Minister to ensure the rights of forest dwellers is protected in the spirit of the Forest Dwellers Act.